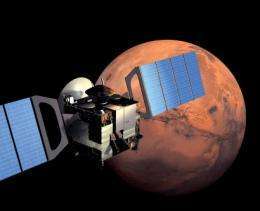 (PhysOrg.com) -- New analysis of data sent back by the SPICAM spectrometer on board ESA's Mars Express spacecraft has revealed for the first time that the planet's atmosphere is supersaturated with water vapour. This surprising discovery has major implications for understanding the Martian water cycle and the historical evolution of the atmosphere. This lack of direct measurements has meant that descriptions of the vertical distribution of water vapour  a key factor in the study of Mars' hydrological cycle  has generally been based upon global climate models. Until now, it was generally assumed that such supersaturation cannot exist in the cold Martian atmosphere: any water vapour in excess of saturation was expected to be converted immediately into ice. However, the SPICAM data have revealed that supersaturation occurs frequently in the middle atmosphere  at altitudes of up to 50 km above the surface  during the aphelion season, the period when Mars is near its farthest point from the Sun. Extremely high levels of supersaturation were found on Mars, up to 10 times greater than those found on Earth. Clearly, there is much more water vapour in the upper Martian atmosphere than anyone ever imagined. It seems that previous models have greatly underestimated the quantities of water vapour at heights of 2050 km, with as much as 10 to 100 times more water than expected at this altitude.
" This has implications for the rate at which water has been lost from the planet and for the long-term evolution of the Martian surface and atmosphere." terraforming ??? dude the palnet doesn't have a magnetosphere, solar wind has been stripping the atmosphere because of this lack. If this is terraforming - humans need to wake up , because that means some alien civ has the power to make our core stop rotating. I remember when they detected a little snow at one of the landers a few years back. I think this study lends evidence to the wetter models of martian past, rather than the 'drier' models that are coming out. If mars is still able to lose significant amounts (SIC) water through photodissociation, then that means that it likely had similarly more water to start with. 1. the photodissociative effect is rather slow, and would have negligable affect compared to terraforming over a few hundred or thousand years. If we had the ability to terraform mars, then we would also have the ability to maintain it. 2. The lack of a magnetosphere would have to be dealt with - likely thicker than Earth's, and tailored to help to block radiation from reaching the surface. 3. I'm not sure if Isaac meant good implications, but this has no significant terraforming implications compared to what we already knew. What I meant is that it gives us a better idea of what the hydrologic cycles on Mars are like, which is only logically a small piece of the puzzle in regards to any possible terraforming in the future. If the loss due to photodissociation is significantly slow, wouldn't this just improve the chance at gradually altering the atmosphere ? Basically, the only new information was that there is a substantial amount of moisture in the air at times, under the current conditions. Everything else explained here, like the photodissociation rate and loss, is already relatively well known. We are already well aware that terraforming would require us to massively change the hydrological cycle, atmosphere, etc. We have already known that over time periods that we would work at, that the loss of Oxygen, Hydrogen, etc. is insignificant over human lifetimes. You guys would probably love the books in the Mars trilogy by Kim Stanley Robinson. They are a little bit outdated now, but if you give them a read, you'll probably be amazed about how much he actually guessed right, but did not know for sure at the time. One good idea he used was constructing human dwellings inside the lava tubes of Mars, to provide shelter from radiation. Another idea that I thought was clever was using a space-based mirror/lense to focus sunlight at the surface and vaporize rock as a method of thickening the atmosphere. It would still be poisonous air, but at least low pressure wouldn't be as much of a problem. As it stands now, humans would want to wear a hard suit with climate control, but no existing suit would work because they are too heavy for work on Mars. There's also too much gravity on Mars to use the hopping trick they used on the Moon, so a more flexible suit would also be needed. There are a ton of engineering barriers before humans can be martians. @piroutte - Most of what you said has been covered or assumed already. I do however want to make some corrections to your line of thought. 1. The MS on earth primarily blocks cosmic rays/charged particles - It does very little to directly affect em radiation. The atmosphere primarily blocks the UV/EM radiation. 3. Mars requires significantly less protection due to inverse square of distance. 4. Partial terraforming can be done at higher radiation with microbes that are hardier with more radiation. So Terraforming is in no way out of the question, although it will not come any time soon given the amount of work and technology needed. You're describing the steps we would take currently to colonize mars, instead of terraforming, which is far down the line. Either Quaid started the reactor - or - that vapor has always been there, just like the flora. They just happen to be more noticeable now. High energy EM radiation tends to be hard to harvest, due to the energy it imparts to individual atoms. It can break apart molecules (Photodissociative affect). Photosynthesis is a molecule based chemical reaction. If the molecule is broken at random spots when it absorbs a photon, that makes it difficult to use reliably. That's why hard UV/x-rays/gamma rays are so bad to life. It is impractical to harvest energy from those photons. In addition, life on earth is adapted to absorb energy from the soft uv and upper infrared spectrum. You would need to engineer a new biological mechanism from scratch to go above that. I do agree that we'll want to adapt life to conditions on mars, but first we'll want to hurl some comets/etc to mars, to help adapt it to our view of life. The terraforming is essentially to make it easier for us to exist on it easily after all. @pirouette. life on mars? are you serious? if you have evidence of it then you're holding a piece of evidence that the rest of the world has been waiting for since time immortal. can you elaborate on what you mean exactly. True Terraforming is too expensive and too inefficient with any remotely proposed technology. Water and air SHOULD be imported to the planet via use of comets, however, you don't need enough to make an earth-like atmosphere for the entire planet. You just need enough to use in fully contained, sealed habitats. If figure Mars could support a couple hundred million humans, and a complete biosphere, and an "American" standard of living by the time it was fully developed. Probably the biggest near-term obstacle to colonization is that nobody knows anything about the viable resources on Mars in terms of construction and mining. There is no wood, obviously, so we're talking complete reliance on metals for all construction. We could send a ship to the core of Marrs and drop some nukes around it to restart it spinning. "the palnet doesn't have a magnetosphere, solar wind has been stripping the atmosphere because of this lack." ["Atmospheric escape", Wikipedia:] "The relative importance of each loss process is a function of planet mass, atmosphere composition, and distance from a star. A common erroneous belief is that the primary non-thermal escape mechanism is atmospheric stripping by a solar wind in the absence of a magnetosphere. [...] Recent models indicate that stripping by solar wind accounts for less than 1/3 of total non-thermal loss processes." In other words, this idea is (rather new) folk physics. But there was never any clear evidence of the importance of the magnetic field, just untested hypotheses. Thanks for the elucidation of the (new) role of magnetospheres in retaining planetary atmospheres. I see a lot of misunderstanding of it's role in such matters, such as the one you quoted. I mostly agree. Terraforming of any kind will definitely be a long and difficult process. Initial terraforming activities would almost definitely be partial or contained. The big question if there was liquid water in Mars past. And if so what happened to it? There is argumentation about the marks on Mars surface, could also have been created by lava. I think its likely that there was liquid water though. But as we look at it now i believe Titan has a higher chance of hosting Life than mars in the present.